SpiceJet goes loud on some developments, and silent on the rest. What SpiceJet has done in the last few weeks is to unbundle as much of its services as possible, to find multiple ways in which the airline can make money. Tony Fernandes (Group CEO, AirAsia) and Mittu Chandilya (CEO, AirAsia India), have been fighting for unbundling of services for long. In fact, when AirAsia launched a year ago, it charged passengers for check in baggage. DGCA interference, reportedly driven by pressure from other airlines, ensured that the airline provided a minimum free check in baggage service: 15kgs per passenger. Tony Fernandes regarded this move undemocratic. He had a point: The 15kgs of baggage did not come free, but was included in the airfare, unknown to the passenger. This only meant that every passenger was forced to pay for a baggage service that he or she may not opt for. Business travellers usually have no check-in baggage. Air Transport Circular 1 of 2015, dated 24th March, 2015, seems to be an outcome of the constant requests AirAsia India has made to the ministry. The DGCA now allows airlines to charge for all seats that are pre-booked. Previously, this was limited to just 25% of the seats and excluded the middle row seats. The new circular also talks about “Check-in baggage charges” being unbundled. Although this was present in the previous circular, upon which AirAsia India acted, DGCA had the final say. Things seem to have now changed. SpiceJet is the first airline to have stealthily implemented the circular to the fullest. All the seats on SpiceJet’s aircraft – Bombardier Q400 & Boeing 737, are chargeable when pre-booked, which wasn’t the case earlier. 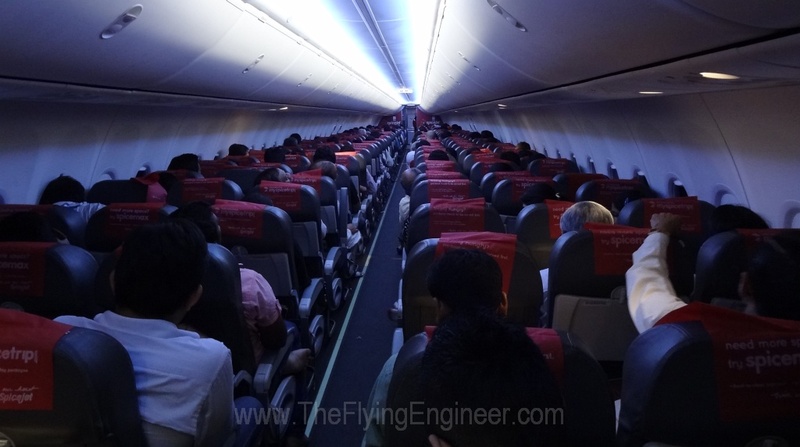 On the Boeing 737-800s (The airline flies 16 B737-800s and 1 737-900, besides three wet-leased Boeing 737-800s which have no SpiceMax extra legroom rows), the middle seats on rows 6 to 13 are charges at INR 100. The window and aisle seats are charges INR 300. Seats on the first five rows are charged INR 1,000. Emergency exit rows are charged INR 600. From rows 16 to 31, middle seats are charges INR 50, while the aisle and window seats are charged INR 100. This allows SpiceJet to potentially generate an additional INR 56,400 per Boeing flight. Assuming a flight with 80% load factor has 25% of its passengers pre-booking their seats, this is INR 11,300 per flight. With this assumption, and a maximum of 129 Boeing flights in a day, SpiceJet may realise around INR 14,50,000 revenue per day from selling seats on Boeings alone. 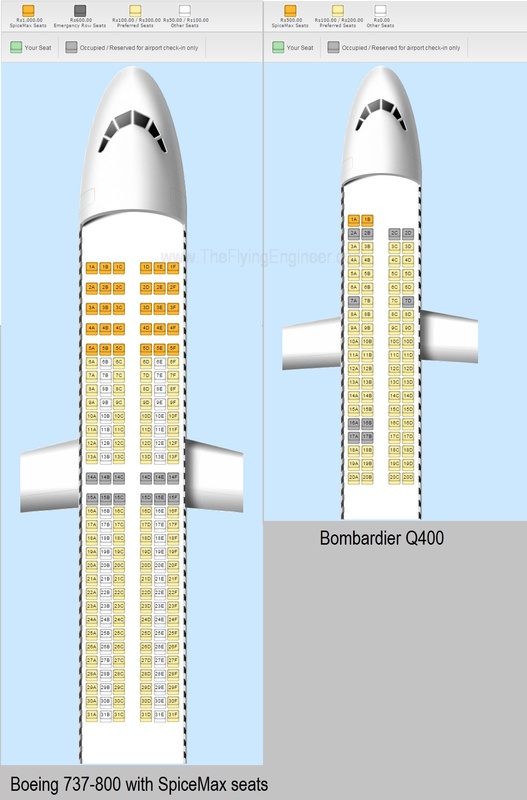 On the Q400s, (The airline flies 12 -13), there are no middle seats. Row 1 (two seats) and Row 2 (right two seats) are SpiceMax seats, charged at INR 500. All other seats upto and including row 6 are charged INR 200. The rest of the seats in the cabin are charged INR 100. This allows SpiceJet to potentially generate an additional INR 11,200 per Q400 flight. Assuming a flight with 90% load factor has 25% of its passengers pre-booking their seats, this is INR 2,520 per flight. With this assumption, and a maximum of 162 Q400 flights in a day, SpiceJet may realise around INR 4,10,000 revenue per day from selling seats on Q400s alone. Together, the airline may, on average, generate 18,66,000 per day from selling seats. Over a month, this will be sufficient to pay almost two Boeing 737s’ dry lease. 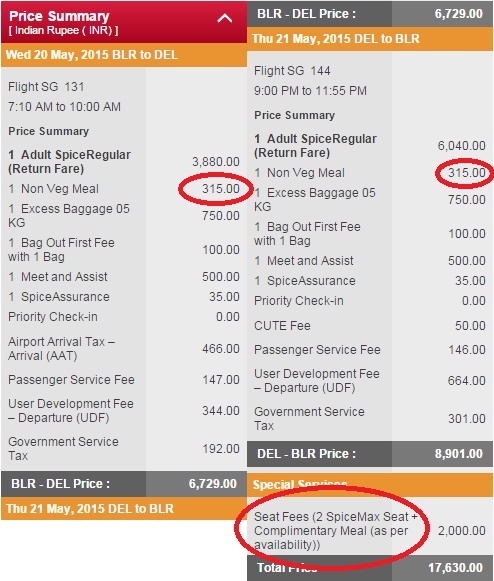 With SpiceJet’s “#Travel Light, Save More” offer, announced on April 27th, SpiceJet offered 1,50,000 seats on sale. The tickets for these seats were on the condition that a passenger did not travel with a check-in baggage. The offer was extended, adding an additional 100,000 seats. In total, SpiceJet offered 250,000 seats for sale with high confidence that these passengers would not have check in baggage. With 15Kg per passenger not occupying the cargo hold, the airline has saved 3,750 tonnes of cargo hold weight. At an assumed average cargo rate of INR 20,000 per tonne (we’ve earlier determined this average to be slightly higher), this allows the airline to ‘sell’ INR 7.5 Crore worth cargo space/weight to its cargo handler, Sovika. If however any passenger chooses to check in their baggage on these tickets, the airline’s T&C requires a flat fee of INR 750 to be paid for upto 15kg. This is the first example in India where a passenger is not granted complimentary 15kg check in service, but has to pay for “any” check in baggage. This may be SpiceJet’s move in evaluating demand for such tickets. Perhaps, if proved successful, the airline may implement a policy of paying for every check-in baggage. SpiceJet also charges for priority check in, Meal (hot meals – 737s and cold sandwiches – Q400s), excess baggage slabs, a ‘Meet and Assist’ service, and “SpiceAssurance”. Priority Check-in charges a passenger INR 200. Hot Meals on Boeings are charged at INR 315 when pre-booked and INR 350 when bought on board. On Q400s, pre-booked Sandwiches are available for INR 200, and INR 220 when bought on board (the illustration for the Q400 meal is misleading as it shows steam coming from the plate that has the sandwich, which is not true. The sandwiches are cold). The SpiceAssist service comes at INR 500 per passenger (assistance from the SpiceJet staff at the airport). All these services are ‘opt-in’ services, as mandated in the DGCA circular (a passenger needs to check the box associated with the service. By default, there must be no service pre-selected). However one service, the SpiceAssurance which charges INR 35 per passenger is pre-checked, which may not be the right thing to do. By paying INR 35, SpiceJet offers passengers a voucher of INR 500 is the flight is delayed by 1 to 2 hours, and INR 1000 if beyond 2 hours. This also offers limited baggage loss reimbursement. This, in our personal opinion, is a poor move. Firstly, this is an opt out service. Secondly, a passenger has to pay for his own compensation for a delayed or cancelled flight. Previously, the airline offered this compensation for free, more. Third, the compensation is in the form of a voucher, which forces the passenger to book on SpiceJet to avail the compensation as a deductible from the next travel fare. Fourth – the voucher is valid for 90 days only. Passengers who miss this INR 35 on the SpiceJet website (not offered through OTAs) will together contribute INR 19,30,000 to the airline, per month (assuming 10% bookings are through the website, and all these passengers miss or choose to ignore the INR 35 charge). For a limited period, opting for a SpiceMax seats entitles a passenger to a complimentary meal. However, the airline allows for a meal to be chosen as well. This means that a passenger pays for a meal that he is entitled to. This seems to be a glitch in the system. These small little things add up to big money! SpiceJet, we hope, corrects the ‘hot sandwich’ and SpiceAssurance. SpiceJet is the first to act like a ‘true LCC’ in India. IndiGo, Go Air, and surprisingly – AirAsia India, are yet to follow with seat selection and no-free check in baggage. On one hand, these moves pitch SpiceJet as a LCC (we now don’t believe in the term, we prefer no frills carrier), and on the other hand, the SpiceMax seats with good legroom and complimentary meals lend it a different image: of good premium economy luxury. Same brand, two images. Does it lead to brand confusion? We think so.